Mahatma Gandhi is a leader that the world is proud of. It’s in grade three that kids are gradually exposed to world history and they develop the knack to explore more and choose their profession. It’s therefore important to teach them the right facts and inform them adequately on the history of the world. 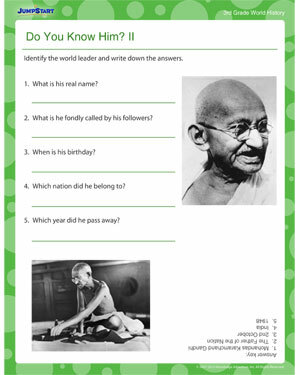 Browse more world history printables on JumpStart and let kids have all the fun in exploring and knowing!